Te Papa Tongarewa, the National Museum of New Zealand is home to the country’s history and that includes our involvement in the wars. 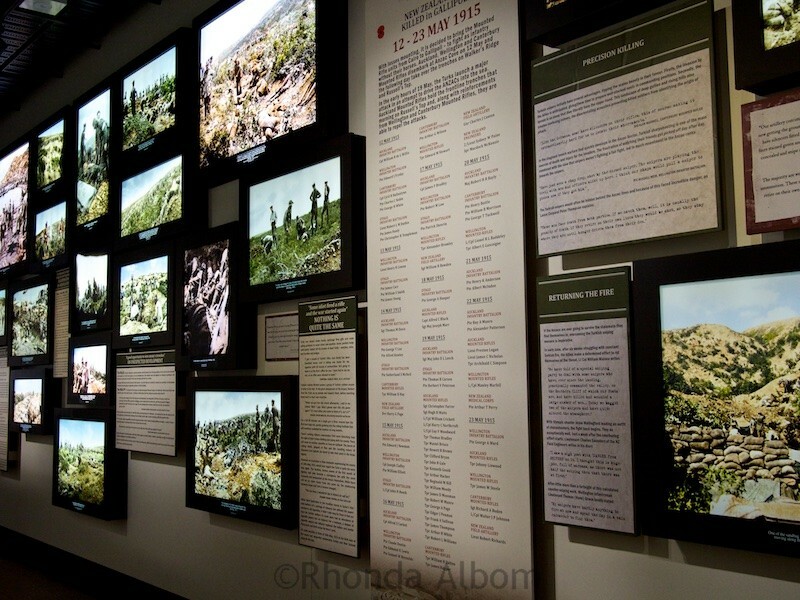 Its newest exhibit Gallipoli, The Scale of our War is one of three must-see war exhibits in Wellington, the nations capital city. It was created by created by Weta Workshop (The Lord of the Rings) and Sir Peter Jackson. The other two are Quinn’s Post Trench Experience at the Great War Exhibition itself. 5 Have you seen either of these exhibits yet? Will you experience Quinn’s Post Trench on your next visit to Wellington? Gallipoli, The Scale of our War is on display at Te Papa Tongarewa, the National Museum of New Zealand. 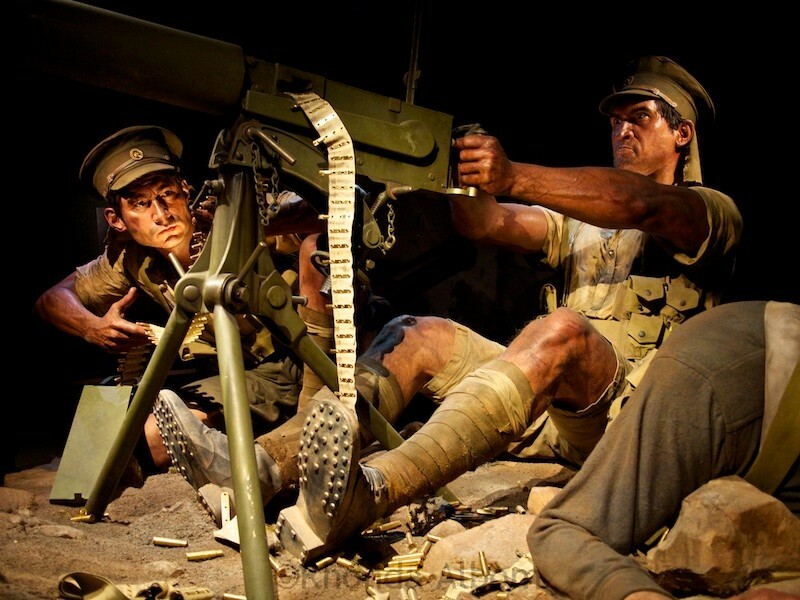 Marking the centenary of the first World War, it was developed by Te Papa working closely with Weta Workshop. It tells New Zealand’s wartime story through the eyes of eight of its citizens. Its large size amplifies the power of the exhibit. The models are 2.4 times human size. Created by Weta Workshop (The Lord of the Rings) and Sir Peter Jackson, they are so lifelike it leaves you speechless. Take a look at the size of the volunteers versus the sign. It is similar perspective to the models above. I wish I had added a person to any of the three above to give proper perspective. Te Papa Tongarewa, the National Museum of New Zealand sits on the waterfront at 55 Cable Street. Locals simply call it “Te Papa”. Open daily from 10 am to 6 pm, Te Papa is always free to enter (and has free wifi). Te Papa opened in 1998 after the merging of the National Museum and the National Art Gallery. 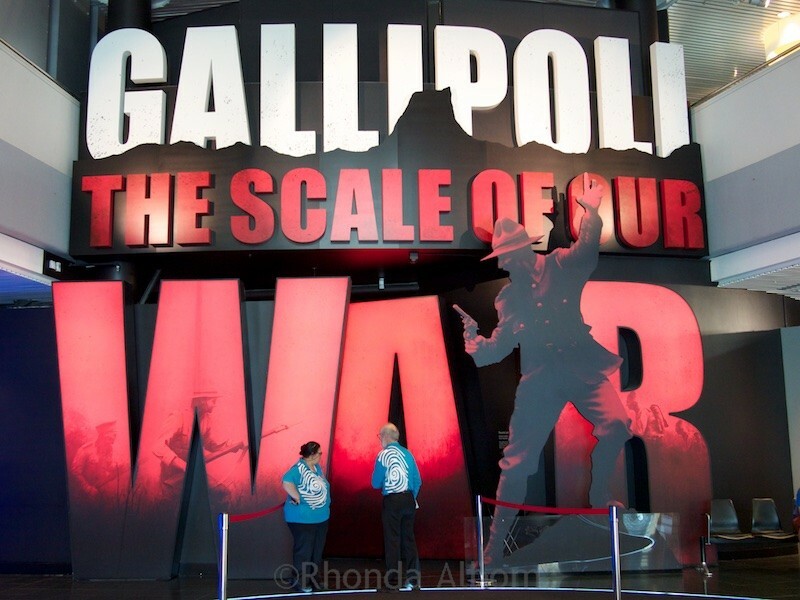 While some special exhibits have fees, there is no entrance fee for Gallipoli, The Scale of our War. It takes about an hour to go through the Gallipoli exhibit, longer if you read it all. The Gallipoli exhibit closes in 2019. It is a lovely walk from downtown, or if you are a visitor and trying to see a lot, the Wellington Hop-on Hop-off bus may be your best option. Te Papa is one of the 11 stops from the bus. It also stops at other great Wellington sites like Zealandia, The Great War Exhibition, Wellington Zoo and the Botanic Gardens. 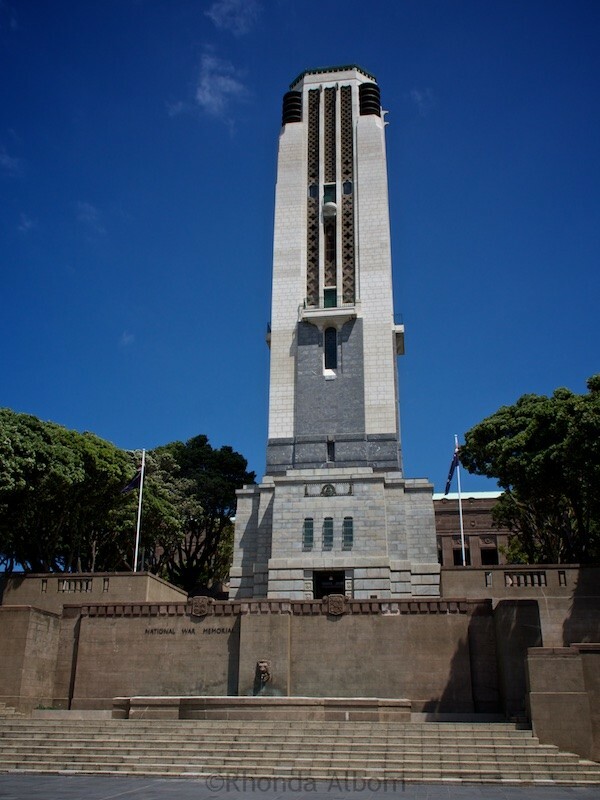 The National War Memorial is located on Buckle Street in Wellington. Dedicated in 1932, it commemorates the first world war. Inside the National War Memorial. 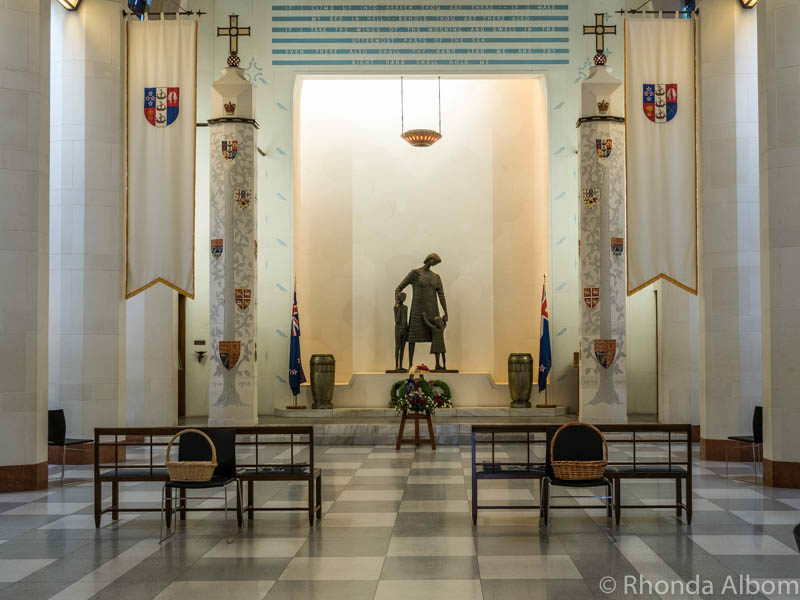 ANZAC Memorial, also in the Pukeahu National War Memorial Park in Wellington. 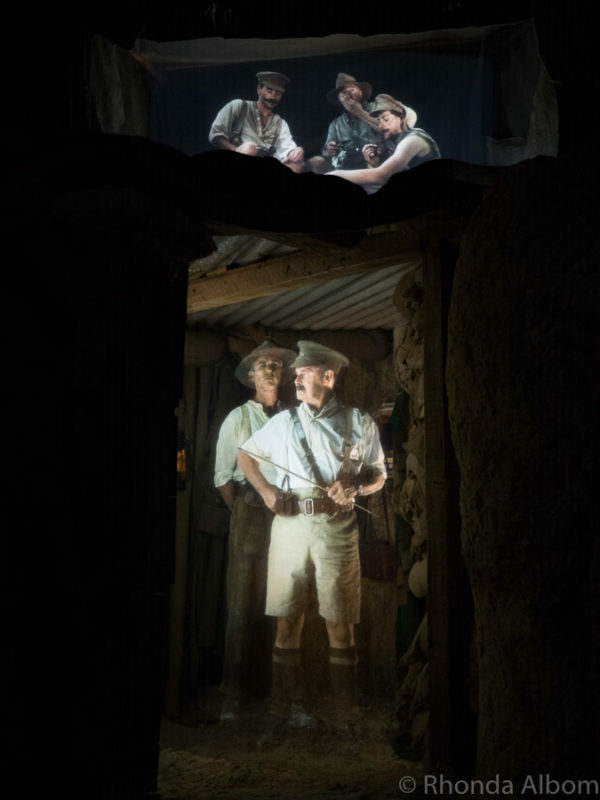 The recently opened (April 2018) Quinn’s Post Trench Experience is Sir Peter Jackson’s latest addition to World War I history in Wellington New Zealand. The experience at the Great War Exhibition is a one-of-a-kind. “It takes Peter Jackson’s creativity to pull this together,” according to the museum’s general manager. Update: I am shocked and saddened to say that this fabulous experience lasted only eight months before politics, education, and finances clashed, and it was closed – at an expected removal cost to New Zealand taxpayer of $12.7m (for both Quinn’s Post Trench Experience and the surrounding Great War Exhibition). Looking for something else to do in Wellington? Check out these 37 activities in the nations capital city. 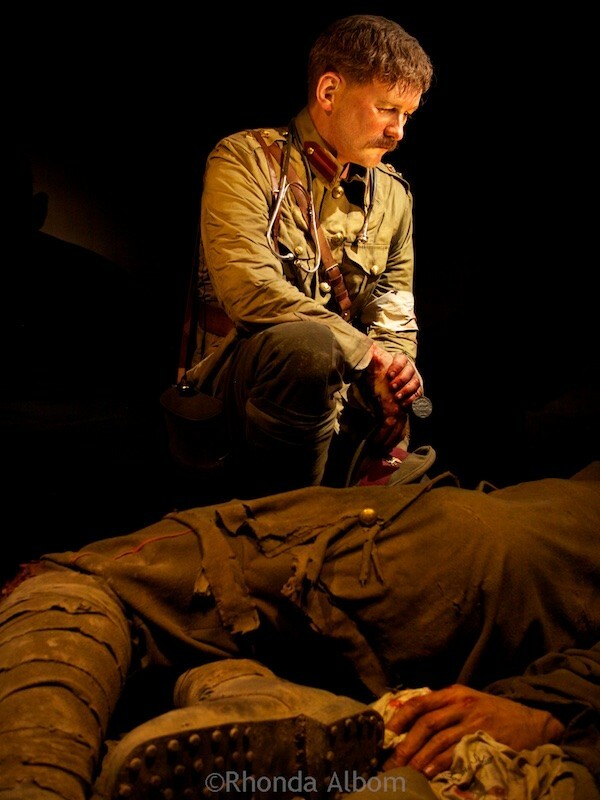 Commissioned by the New Zealand government, Sir Peter Jackson and his team created a lasting and memorable recreation of life in the trenches of World War I. In 1915 at Quinn’s Post the ANZACs found themselves too close to the Turks. 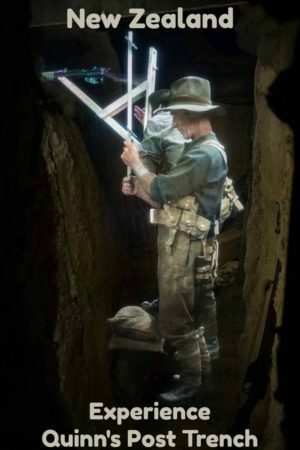 Photos, stories, imagery have been used in the past to help people understand what it was like, but this experience by Jackson actually takes us into the trenches at Gallipoli. 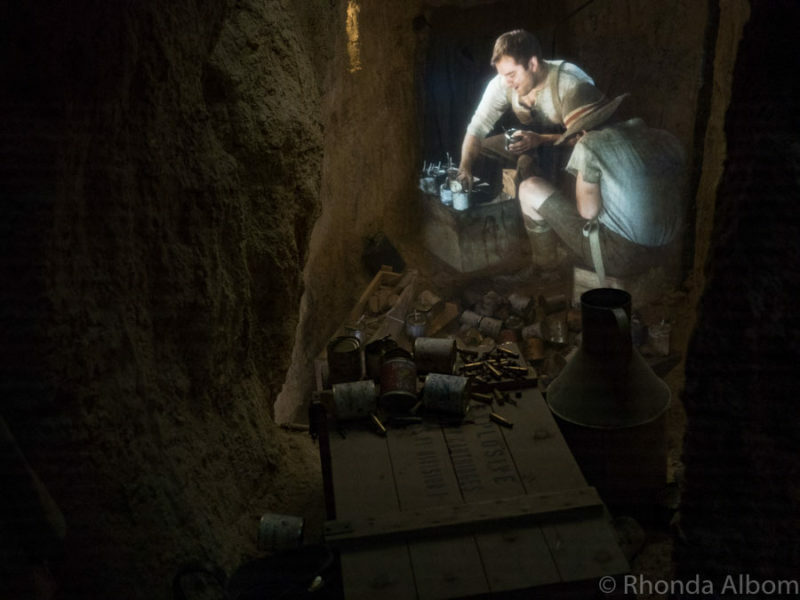 A hologram soldier makes hand grenades from empty food tins, shrapnel and explosives inside the new Quinn’s Post Trench Experience at The Great War Exhibition. I think every New Zealand and Australia student learns about the WWI battle in Gallipoli Turkey from a young age. This exhibit is different. Rather than learning, we experience. As we move through the trenches, the sounds, sights, and smells of the war surround us. Holographic soldiers tell their stories in words taken from their diaries. Jackson shot enough footage for three full-length films. It’s as if we were guided through Quinn’s Post Trench by the ghosts of its soldiers. We found ourselves mesmerised. Sometimes frozen in disbelief, only to be awakened by the sounds and smells of nearby explosions. Then a soldier would instruct us where to go, and we would move quickly to safety. It’s not the real war, and we were never in any danger, but Quinn’s Post is about as close as one can come to experience what it was like for the soldiers here. It’s not an exhibit for everyone, but it should be. Lieutenant-Colonel Malone (front) from the Wellington Infantry Battalion took over the post from Australian commander Quinn (who was later killed in battle) and lead the ANZACs at Quinn’s Post Trench. With the sounds and smells of war surrounding us, this was one of many trench battles we witnessed. One of the tunnels we passed through inside the trench. You can see the ground is uneven, but solid (so you don’t get dusty or dirty in the experience). Visitors have a variety of experiences, sometimes we even sit and listen to the soldiers. Photo Credit: Photo supplied by the Great War Exhibition. Used with Permission. 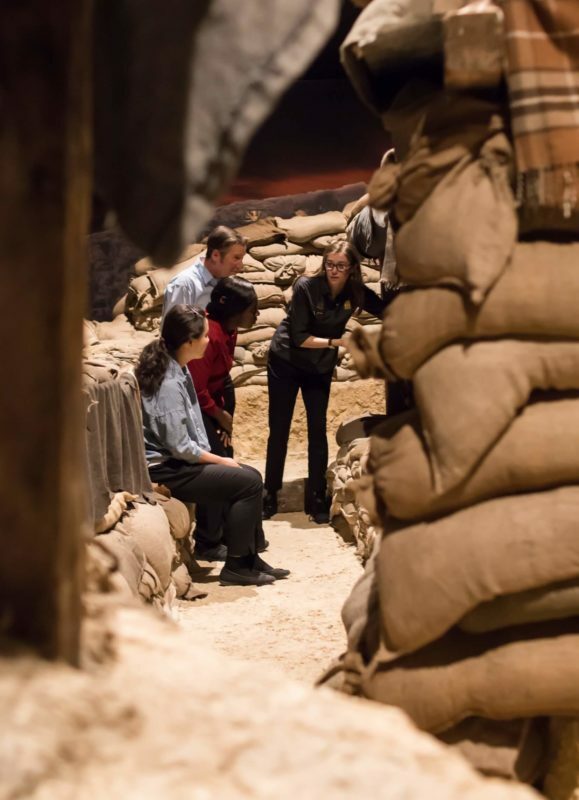 Quinn’s Post Trench experience opened to the public on April 13, 2018, at the Great War Exhibition in Wellington New Zealand. It takes place indoors using theatrical lighting, loud noises, and even smells help to recreate the actual experience. 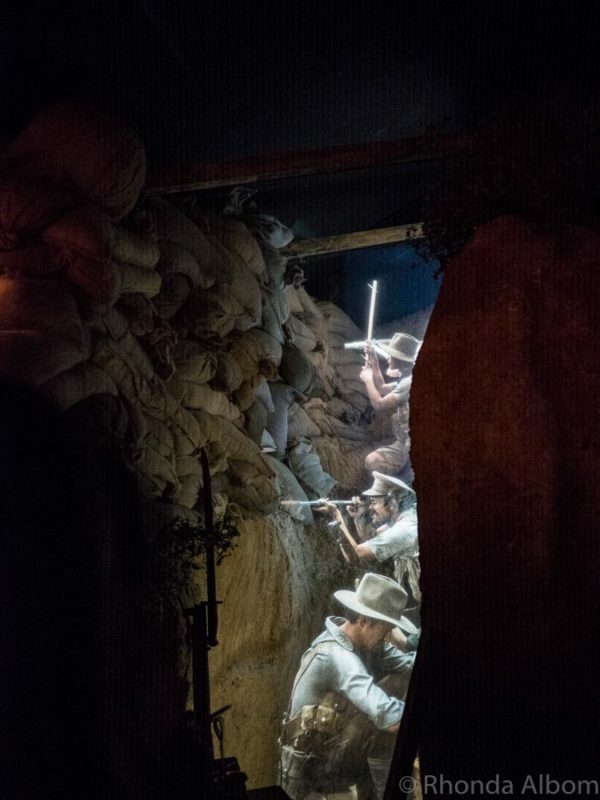 A guide moves through the trench with visitors to gauge the speed. 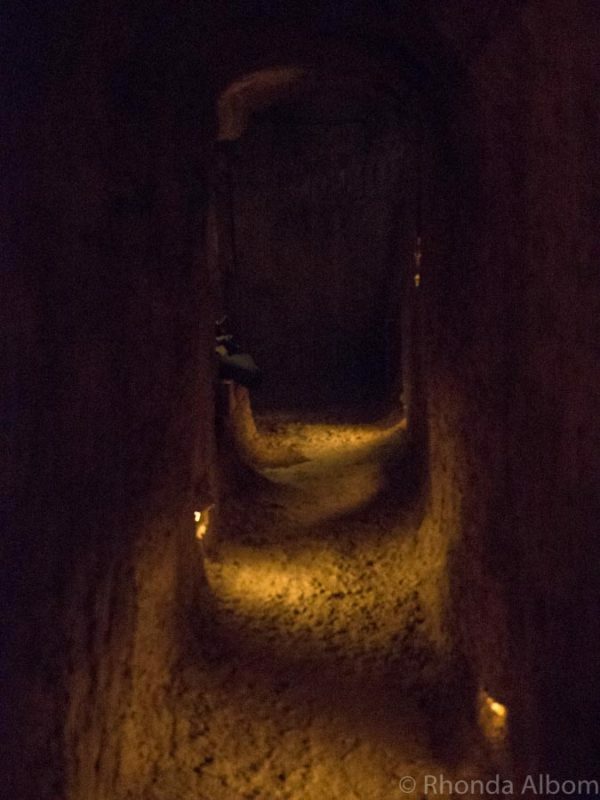 The trench is experienced in small groups of not more than 12 people. It is not recommended for children under the age of 8. Parental guidance is essential. There are some steps and uneven ground and no handrails. Also, it is not wheelchair accessible. The lowest ceiling height is 160cm (63 inches), and the narrowest tunnel is 70 cm wide. I had worried that I might feel claustrophobic inside the exhibit, but I never did. 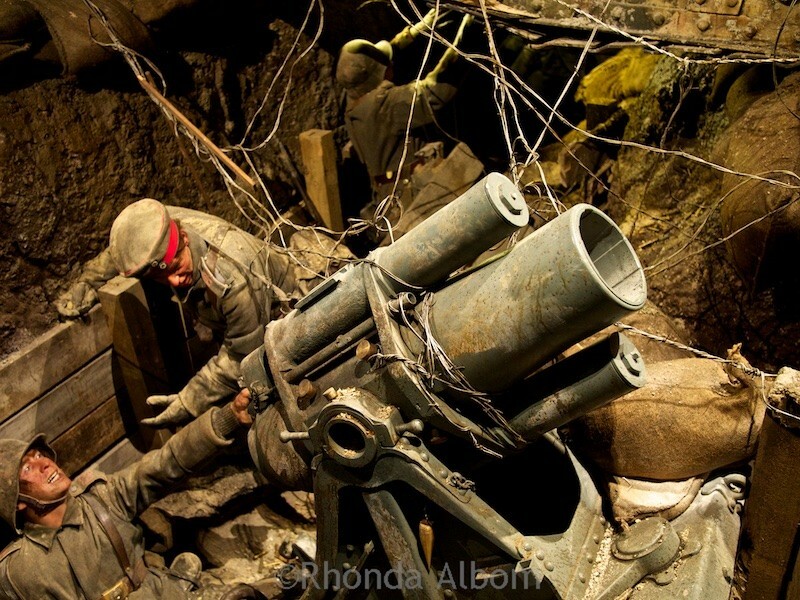 Quinn’s Post Trench is located inside the Great War Exhibition, a creation by Sir Peter Jackson. This $10 million dollar project was created to mark the centenary of the Gallipoli Landings where 2,779 Kiwis lost their lives. The war exhibits housed here take you from pre-1914 to the 1919 signing of the Treaty of Versailles. Much of the war exhibits come from Sir Peter Jackson’s private collection. We found the best way to really understand and get a clear overview of the history was to take one of the guided tours. I recommend the tour before going through the trench. This is what we did, and it helped to give us the history leading up to Gallipoli, making Quinn’s post an even more powerful experience. 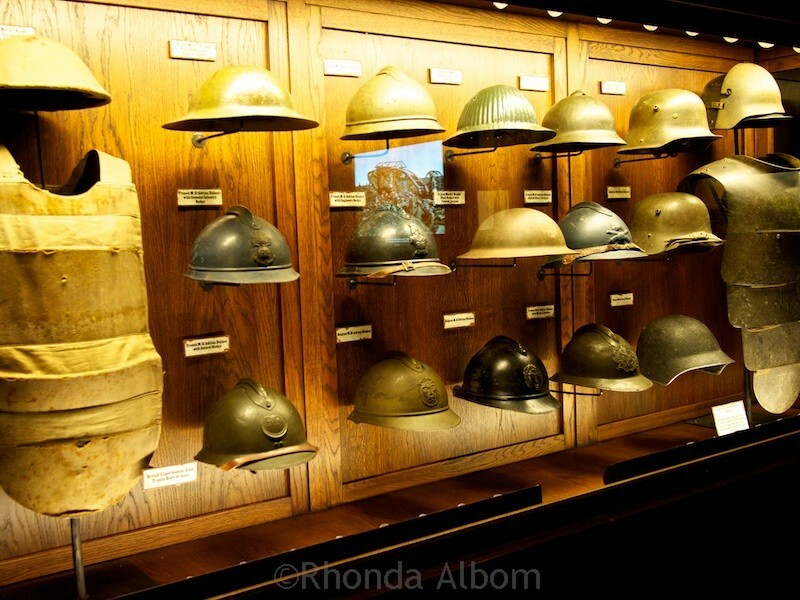 A collection of army helmets which probably belong to Sir Peter Jackson, although not identified as such. The war exhibits in the Great War Exhibition are life-size. While not as overwhelming as Te Papa, they are powerful. Have you seen either of these exhibits yet? Will you experience Quinn’s Post Trench on your next visit to Wellington? What a fascinating exhibition. Honestly, I’m not sure I could do it. I know you said you didn’t feel claustrophobic, so maybe I could…either way it sounds like a completely new and innovative take on learning about WW I.
I’ve not seen these and we just don’t travel anymore. Okay we never really traveled all that much anyway. I would love to see this though. I was just talking with friends about how each generation forgets about the last war and how soldiers of WW2 are passing away now, then the Vietnam War but this war, WW1 is especially horrific to me. I hope to visit this exhibit one day. I like when exhibitions really take you to a place and make a particular moment of history vivid. Also, I think this type of exhibition is appealing to people who usually do not enjoy museums or indoor activities. It is great to know those are enjoying the experience too. Wow, what a way to bring the war to life, to get a real sense of what those men felt and endured! This is definitely a unique way to teach younger generations history! Would love to visit as I am a big WWI/II nerd! As an ex- history teacher this would be an absolute must visit for me. Both look absolutely fantastic and really interesting. Those models look incredibly lifelike!! This sounds really interesting. It can be hard to visit a war museum and think of all those lives lost but at the same time its a great way to remember what they all went through. We shouldn’t just brush it away and forget such a big part of history. I like experiential museums like these. I also like war museums. This was so fascinating! I’m American and WWI is not a much-discussed part of our history but I know it’s important to people in New Zealand. I was in Wellington in December and I’m sorry I didn’t see Quinn’s Post Trench Experience. 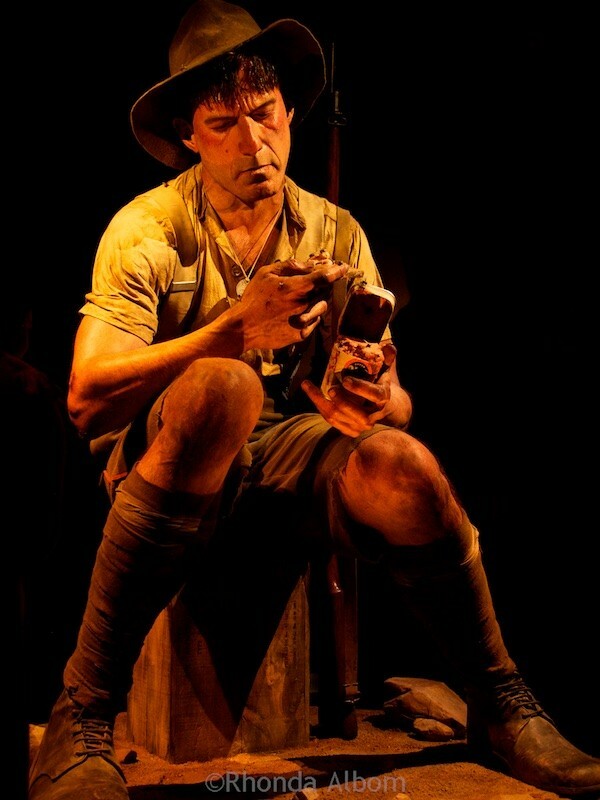 I did go to Te Papa, but sadly I didn’t have time to see the Gallipoli exhibit because it was so crowded. Quinn’s Post only opened last week, so it wasn’t here in December when you were here. What a beautiful museum! Mesmerizing indeed. I agree that it’s one thing to read about something and a totally different one to experience it personally. Seeing these exhibits surely help you understand what it was like for those poor soldiers in the the trenches. Excellent pictures, like always, Rhonda. You made me feel like part of the scene. This is so interesting. I didn’t know much about ww1 before I moved to Australia where I got to experience Anzac day. It is such an important part of history, but you don’t learn much about it in Norway since we were not a part of that war. I love visiting war museums and recreation of the war and events. It is important that we don’t forget about the fallen soldiers and what they fought for. Thank you for sharing the experience. This would be a must-see if I ever visit this area. The trench experience is the kind of museum I love — to imagine how it felt to be in those muddy, dangerous trenches. I got to spend hours at the excellent WWI museum in Kansas City. On this hundredth anniversary of the end of WWI, these kinds of remembrances are so important to honor those who served. Hi Rhonda. I can’t believe that I wrote that comment 2016. This time it gave me such a strong feeling how people had to deal with war. After reading your blog, I wonder what will happen to us if Trump, Putin and China get into a war. I’m afraid I wouldn’t be able to enjoy my cruising. See ya my friend. Wow, this is indeed interesting and amazing. I love how they made some twist to make this museum more interesting than the normal museum that we used to know. Ambling around and experiencing the real WW I means exciting and amazing. I can really feel the essence of not learning about the past by experiencing it and just by the book. I will surely bookmarked this for my future reference. Thank you so much for writing about your experience here. I truly appreciate it so much. I’m learning so much more about this beautiful land being here now Rhonda. Inspired. It helps me connect more deeply with a place as I dive into some history lessons. We visited both of these exhibitions during our recent trip to NZ. They were both excellent exhibitions. Gallipoli was such a defining moment for NZ and I didnt appreciate that till our visit. Being British we have a big list of battles we learn about and have relatives who fought in them, but for the ANZAC forces to go across the world for this really affects them to this day. It was particularly awful to realise how many troops were sick and lost their lives because of poor supplies, conditions or poor leadership as opposed to the enemy. It was also interesting to learn about the steps for reconciliation from NZ and Turkey- a war of a bygone age. It’s always interesting to see what expats can do/see in their new cities, and I love anything historical. Of course, places like this are so sad, but they’re so important. I had to do double-takes on the exhibits; they look 100% real. They look real when you are standing there too – expect they are giant. This is what Weta does, it’s why they are used for so many movies. Wow, the figures are amazing! Seeing the exhibition in person must be really powerful. It was almost overwhelming. The precision and magnitude are incredible. What powerful and moving displays. I can’t believe the exhibition is free how fantastic. I think most of the public museums in New Zealand are free. This is at the National Museum. Actually, there are plenty of really impressive free things to do in Wellington, the nations capital. Those models seems really real, especially the one in the first picture!! Yes, except they are larger than life – and so realistic. It’s almost eerie. Wow! I have never been to either museum but these seem so impactful. The mannequins are so life-like and that building is very impressive. Thank you for sharing! So life like! Museums like that are so sobering, thank you for sharing this! 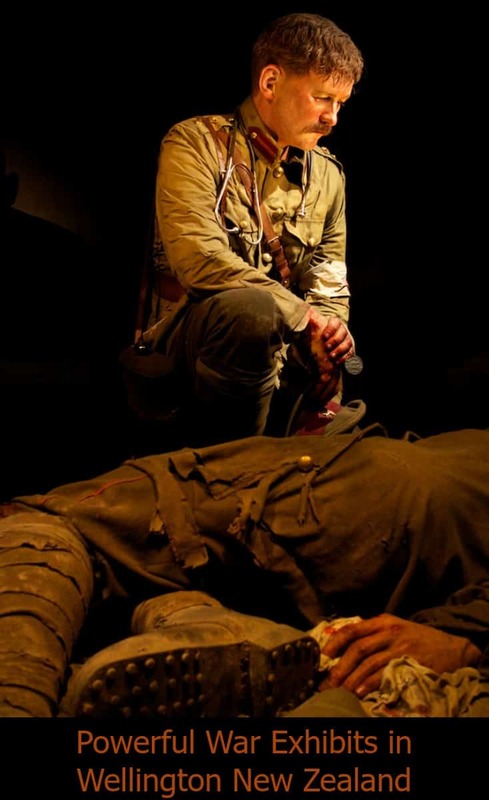 The Great War Exhibition is fully dedicated to the war, the Gallipoli exhibit is only one special exhibit at Te Papa. they are powerful indeed…I’ve seen those diorama and always be amazed.. It was the enormous size and detail of the one at Te Papa that really amazed me. Wow the photos that you took and the faces on them, the expressions are amazing! This sounds like an amazing event to visit. YOu are so lucky to have this. I had heard this was an outstanding exhibit, but even with the great reviews, I wasn’t prepared. It is so powerful. And Yes, New Zealand is lucky to have these exhibits – and they are both free. I thoroughly enjoyed them and your photos. Glad you got to see them both as well. The models are life like. I’d love to see the exhibit. Hello Rhonda. Though war memorials are important, Anything about wars, guns, & death upset me so much. I know, I know they are important to make people realize the past to no more fight and have wars but look at our world. NO ONE IS LISTENING. Death & destruction are around us every day. For now, all I want to see to beauty and life because someday we will all die so all I want to life. Your photography always give me beauty & life. Sorry about my comment. I guess I’m down at the moment. maybe tomorrow I’ll be better. See ya my friend. Sorry to upset you today. And, sadly you are so right, no one is listening, or least not enough people. All we can do is visit these places and share them. I will post beauty for my next post. The lighting is so amazing on those top images. That does look like a great museum to visit. Te Papa is one of my favourite places to visit in the country. It is the only place we ALWAYS visit if we are in Wellington. I have seen the Vietnam Wall and Arlington and they moved me to tears. War is a terrible thing, and yet we have to remember how awful it is to try to keep from having another. We visited Washington DC and saw both of the two you mentioned. That wall, the way it dips down, it catches you by surprise. You just don’t expect to see so many names. So sad. Wow They look real but they are more than double the human size, must be very impressive! I would go see them! Especially considering who created them. They look amazing. I was actually thinking about you as I wrote this post, as I knew you would be interested in their creators. I would love to see this. So powerful. The images here really don’t capture the power of these exhibits. I think they will both be around for about four years, so now you have a timeline for your visit. It’s so important to visit exhibitions about the wars – makes us remember. Those are powerful exhibits! I can only imagine the impact they would have on me! It’s interesting, as you walk through Te Papa, the National Museum, you see groups of people walking, talking, laughing – then you get into this exhibit and people are quiet and contemplating. . Very powerful. Great history. I have been to some war museums here in the States. Being a Gulf War vet myself, it strikes a cord in me. I think these might be a bit overwhelming for you as a vet, although they very clearly honour and respect New Zealand vets. A year a go we were gearing up for our visit to New Zealand. In retrospect we didn’t spend enough time there. LOL – I don’t think it is possible to spend enough time here. I have been here for 12 years and am still always discovering new places. Thank you Rhonda for sharing this museum, amazing reproduction, some to real for me. But great history to share! My dad was in WWII, stationed in the Philippines. This page only touches on the magnitude of these exhibits. they are much more real when you are there. That was interesting I like museums I used to love visiting The Imperial War Museum here. We didn’t visit that museum when we were in London. I haven’t really been to any war exhibits. It has been a really long time since we went to a museum here in Singapore. I don’t generally go to these type of exhibits. However, there were five of us on that trip, so we shared the selection, and with Sir Peter Jackson and Weta involved, you knew they would be amazing. 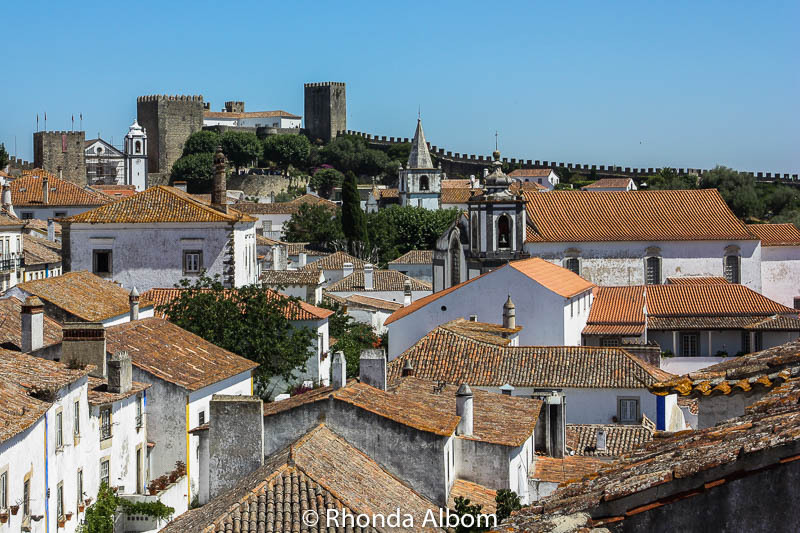 Hi Rhonda – what amazing exhibitions to be able to see. I usually steer clear of War Museums – though I must get up to the Imperial war Museum now it’s been brought up to date. Those are extraordinary … and must have been incredible to visit – I can quite understand why you felt ‘compelled’ to take a look – thanks so much for posting here. The sizing is such a surprise … I’d love to visit – just that Wellington isn’t on my immediate bucket list! The reviews from both of these seem compelling enough to visit, and as a travel writer I often step outside of my personal comfort zone to give a more complete picture of a destination.